Colonel Barrington Baker was born at St. Lucia, his father holding a commission in the army. Leaving St. Lucia for South Africa, he accompanied his father through the Kaffir War, and, settling down in Durban, gained his first experience in boat sailing. Having joined the 64th Regiment, stationed at Malta, he went there, and in partnership with three brother officers built and raced the 5-ton cutter Petrel. The partnership being broken up, he bought a Bermudian-rigged 5-tonner, but this boat was wrecked. 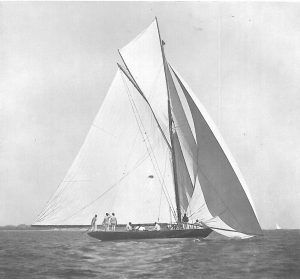 He chartered the schooners Syrian and Lily, and then bought the 13-tonner Gipsy, which won for him a cup at the first regatta of the Malta Yacht Club, of which he was one of the founders. In 1870 he took charge of the Royal Naval Ordnance Depot at Plymouth, but three years later he went to Ashantee. In 1880 he designed for himself the 3-ton c.b. cutter Pollywog, which proved a successful prize-winner, and in every start won a prize. After serving in Jamaica, he returned to Devonport, where he was occupied in designing and building boats of every description for the Royal Artillery. In 1893 he bought Kite, designed by Fife, and, racing this boat, won ten prizes out of twelve starts, seven being. firsts. He made many well-conceived alterations in the accommodation of this yacht. Inyoni, Cutter. Built for the Earl of Dudley. He is closely associated with the legislative work of the Yacht Racing Association, of which he is a member, as well as being officially connected with a number of yacht clubs. Besides being one of the founders of the Malta Yacht Club, he was also one of the founders of the Royal Jamaica Yacht Club, and of the latter he was first Rear-Commodore. He is Vice-Commodore of the Royal Plymouth Corinthian Club, and Rear-Commodore of the Royal Cruising Club. He now owns the s.y. Inyoni and the 1-rater Kite. Clubs: Royal Cruising, Royal Plymouth Corinthian, Royal Jamaica, Fowey, Ports­mouth Sailing, Start Sailing. Address: His Majesty’s Gunwharf, Plymouth.